Chennai’s self-styled historian S. Muthiah has been propagating the fable of Thomas’s visit to India promoted by the Portuguese over 500 years ago. The Catholic establishment has generously supported this fable. Elders used to mention to their children about the presence of an old Shiva temple on the sea coast. 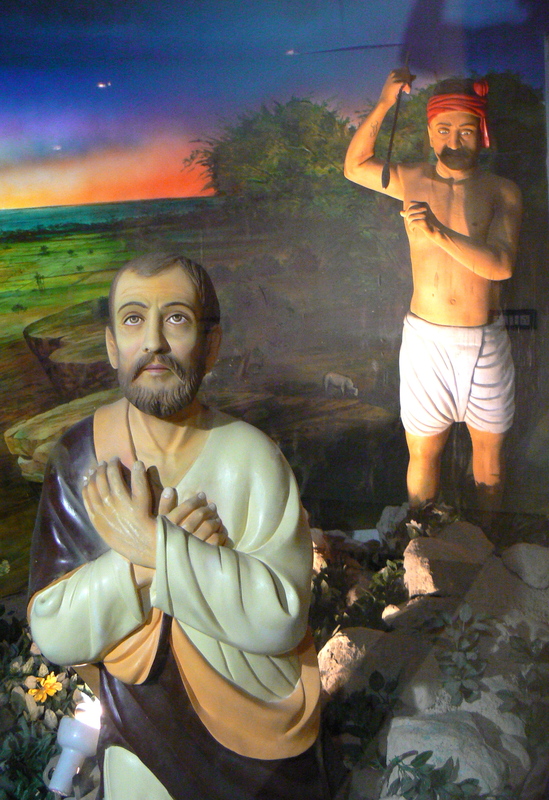 After publication of the book The Myth of Saint Thomas and the Mylapore Shiva Temple by Ishwar Sharan, in 1991, the public were aware of the dangers of the theory of the visit of Thomas to India. The Church was trying to make Hindus villains, like what they have done to the Jews for 2000 years. By 1990 eminent citizens of Madras installed a 15 feet by 4 feet high marble memorial plaque on the eastern gopuram of the Kapaleeswara Temple, Mylapore, Chennai, whereon they inscribed that the Portuguese destroyed the original temple on the beach side in the 16th century. Though the mischief of S. Muthiah and his colleagues like Archbishop Arulappa, Deivanayagam and Ganesh Ayer were exposed in Ishwar Sharan’s the book, S. Muthiah was in no mood to give up. In an article in The Hindu of 7 January 2004, S. Muthiah had revised his theory. He modified his article, this time without the prefix ‘Saint’ before Thomas, and the title “The Mount of Thomas” was given. But within the article he made a sarcastic remark about Ishwar Sharan. We brought it to the notice of Ishwar Sharan and also Veda Prakash who had done much of the research, and requested them to send a detailed rejoinder to S. Muthiah and The Hindu. Immediately they both sent their rejoinders to The Hindu and to S. Muthiah. And as usual, their replies were not published by The Hindu. His reply exposes how the Roman Catholic Church has written and is writing and trying to perpetuate pseudo history in South India. Here, I would also like to share my experience with your readers. I came across the book The Myth of Saint Thomas and the Mylapore Shiva Temple by Ishwar Sharan and Indiavil Saint Thomas Katukkadai by Veda Prakash, in 2001, and decided to visit the spots mentioned in the book. In July 2001 when I went to the Mylapore St. Thomas Church, the stone pillar from the remains of the old Hindu temple, which was mentioned by Ishwar Sharan, was exactly there near the compound wall, as mentioned in the book. I took a walk around the church. In an area between the main church and a chapel on the backside [viz. a lane from Santhome High Road to the beach, the church on the left and the bishop’s house on the right], there was a board in English announcing “Museum”. It was locked but I saw that there were some broken pillar lengths, and bottom portion of Shiva lingam, and a round stone kept atop the bottom avudayar of Shiva lingam. In the few feet gap between the church’s backside and the chapel, there was a broken Tamil inscription on granite stone piece peculiar to Hindu temples. Subsequently I took some Hindu friends to show these temple remains, and we had to do it discretely. This was to create eyewitness evidence. We made a couple of visits, and found the remains intact. Sometime later, I was driving along the Santhome High Road, and found some construction going on in the church. A new grotto with water fountain and a Christ-like figure standing in the cave’s entrance had come up. I checked up for the original pillar from the temple measuring 12 to 14 feet. It was not there. I was perturbed. At least these remnants from the original temple should be preserved. On a visit in December 2001, I found there was a big celebration going on the church grounds. The pastor was speaking. Some parts of his talk drew my attention. He said that he was worried whether the function would go at all. And so lorry loads of building waste material had to be removed. And one Kumar lorry operator or contractor, obviously close to the church, has done a fine job. He was appreciated and honored by the pastor who spoke on the dais on 31 December 2001. He said that he was greatly relieved, for that building waste removal has not attracted any unwanted attention. I presumed that what he meant was that the new stage was constructed after the removal of the old mandapam from the compound, and the pastor was worried about the consequences of this illegal removal. It is not known whether San Thome Church authorities took permission from the Archeological Survey of India (ASI) to remove the ancient Shiva temple rubble? Secondly, they should not have dumped the lorry loads of the old dilapidated mandapam, completely removed from the compound and clandestinely taken to some waste yard. Did they take permission to do it from the Archeological Survey of India? The Hindu immediately put a copyright notice on the article on its online edition so that it could not be reproduced for comment by Ishwar Sharan in 2004. The notice has since been removed and the article has been made available for comment. 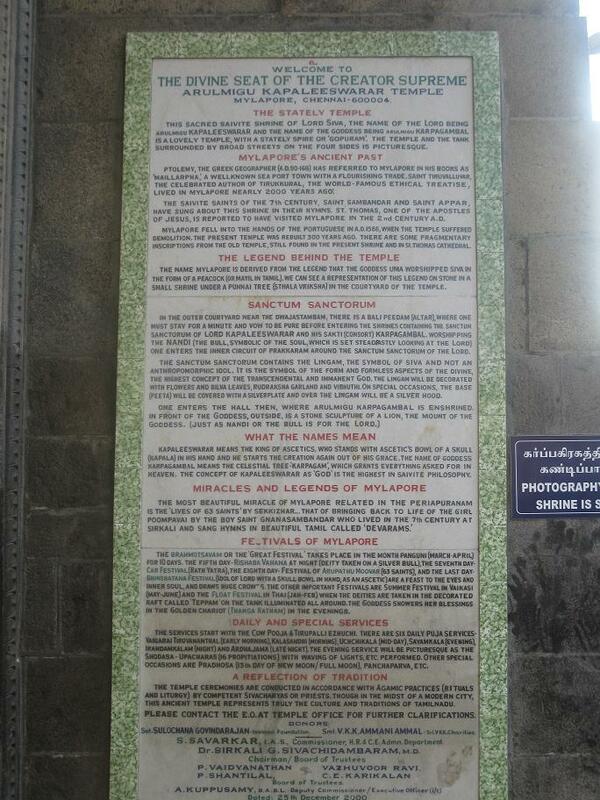 The Archeological Survey of India is deeply involved in the cover-up at San Thome Cathedral. It is a government department and therefore subject to the dictates of the politicians in power and their policy of minority appeasement. Even former directors of the Tamil Nadu Department of Archeology like Dr. R. Nagaswamy, who have all the details of the destruction of the Kapaleeswara Temple by the Portuguese and the building of San Thome Cathedral on the ancient temple site, are not willing to speak out. This entry was posted in christianity, indian history, ishwar sharan, kapaleeswara temple, mylapore, religion, s. muthiah, san thome, santhome cathedral, st. thomas, thomas the apostle and tagged chennai, chennai media, christianity, g.p. srinivasan, hindu temples, indian history, ishwar sharan, madras, mylapore, s. muthiah, saint thomas, san thome cathedral, temple breaking, the hindu, veda prakash. Bookmark the permalink.